Only two months later, this coalition exhibits some severe cracks. 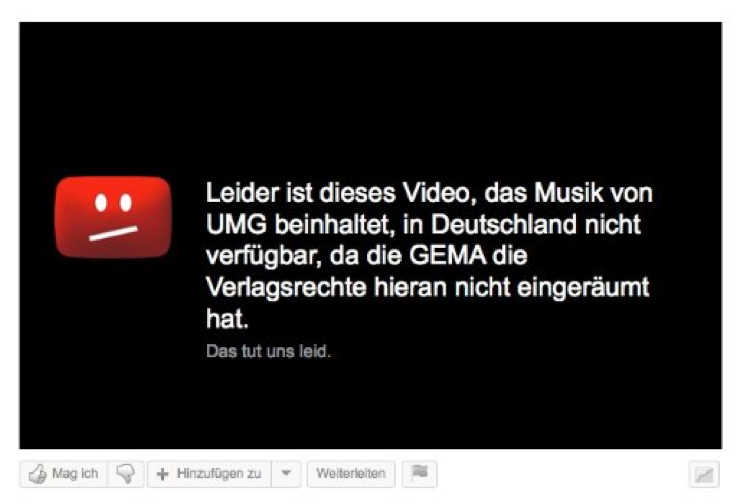 And the reason for these cracks is the extensive blocking of YouTube videos demanded by GEMA – something we have repeatedly discussed on this blog (see, for example, “Viral Web Videos and Blocked Talent” and, most recently, “Art Across Borders“). Originally, blocked videos only delivered a page stating that the video was not available “in your country” and referring to the rights holder – the latter mostly being one of the leading media corporations such as Universal, Warner or Sony. The latter statement emphasizes the transnational dimension of the problem. Google, the owner of YouTube, is a true global player, whereas copyright collectives are nationally dispersed monopolies; a situation that allows Google to divide and conquer by making agreements with cooperative collecting societies, thereby putting pressure on not-yet-cooperative ones. Consequently, Sony Music CEO Berger also points to agreements between Google and copyright collectives in France and Italy. Other reasons for substantial bargaining power on the side of Google/YouTube are that blocked videos deliver no revenues at all and make it more difficult to share videos in social networks such as Facebook; the latter is a problem for music labels since a YouTube video going viral regularly increases record and download sales. Taken together, at least in this conflict, time is on Google’s side. Tertius gaudens.